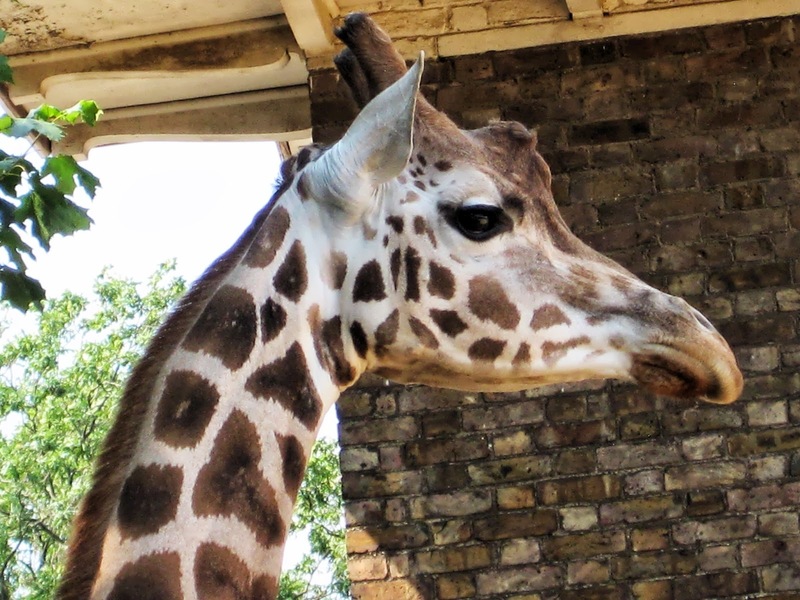 With the big flood in Calgary last month and it's devastating effect on the Calgary Zoo, I thought I'd have to put my zoo summer plans on the back-burner Then London happened! Corral: There should be a means of corralling ALL kids under 4 - either a backpack harness or a stroller. We opted for strollers for the girls and their 3 year old cousin. The older boys could walk. TIP: Unless you have super-strong shoulder muscles, do not do this with a wagon. I tried the 50+lbs of children in a wagon dance and it was not a pretty experience. Feed: Don't feed the animals. Do feed the kids every 45 minutes. The hungry kid-angry kid formula holds true for the zoo as well. Plan on a bag filled with favorite snacks plus at least a bottle of water per person. TIP: If you are the designated snack packer do confirm what ALL the kids like to eat. I packed a bag filled with all of the girls' favorites assuming their cousins would like the same foods. I was wrong! How did it go? 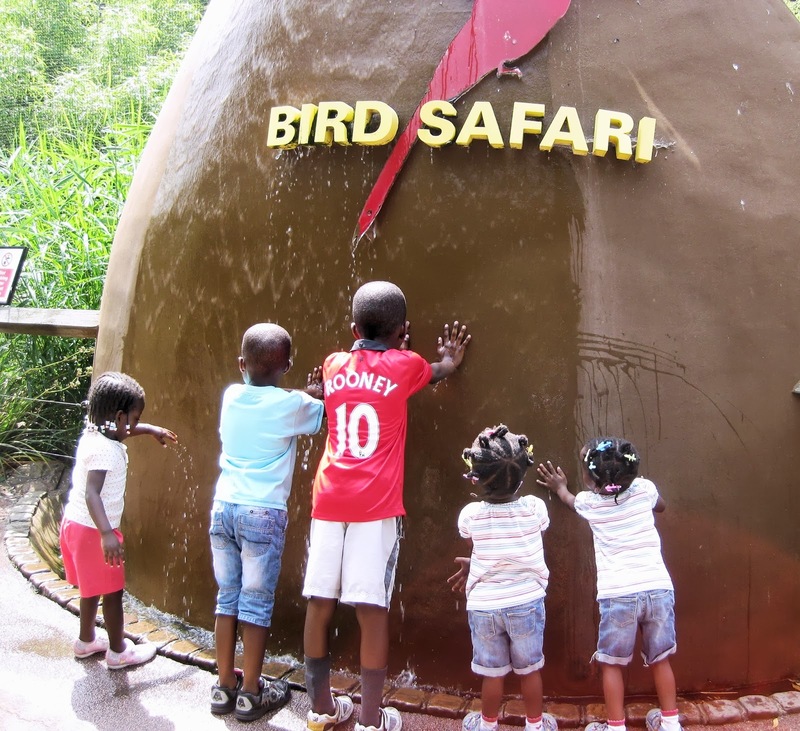 The kids had too much fun.The girls are now at the age where they recognize a lot of animals and can actually be excited to see them. I'm making good progress with this summer list thingie. How about yourself? One month of summer's already gone! 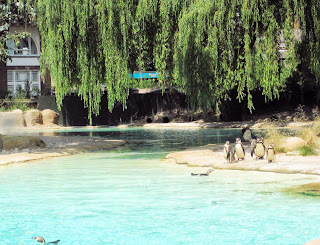 Watch a live show with the girls - Does the zoo penguin show count? Visit or have a playdate with someone new - Do cousins we've never met before count? It seems like only yesterday that I packed myself, toddler twins, a double stroller, a bag filled with everything-but-kitchen-sink and bravely embarked on a 5 hour flight to New Jersey from Calgary. I learnt a lot on that trip. With the memory so fresh, you would think that a rational person with a fully functioning "church mind"* would not do that again. Well... I didn't. I broke my own records. This time I embarked on a 9 hour flight from Calgary to London. I couldn't pass up on an opportunity for the girls to see their grandma (who last saw them when they were 5 months old) who was visiting London from Nigeria. To be honest, the 2 flights went way better than I expected and one of the things that made a difference compared to the New Jersey trip was that now the girls were big enough to use the CARES harness. 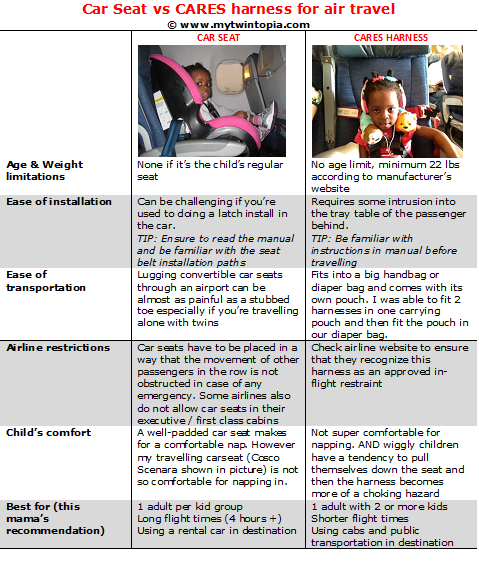 Without further ado, here's my comparison of flying with a car seat versus a CARES harness. 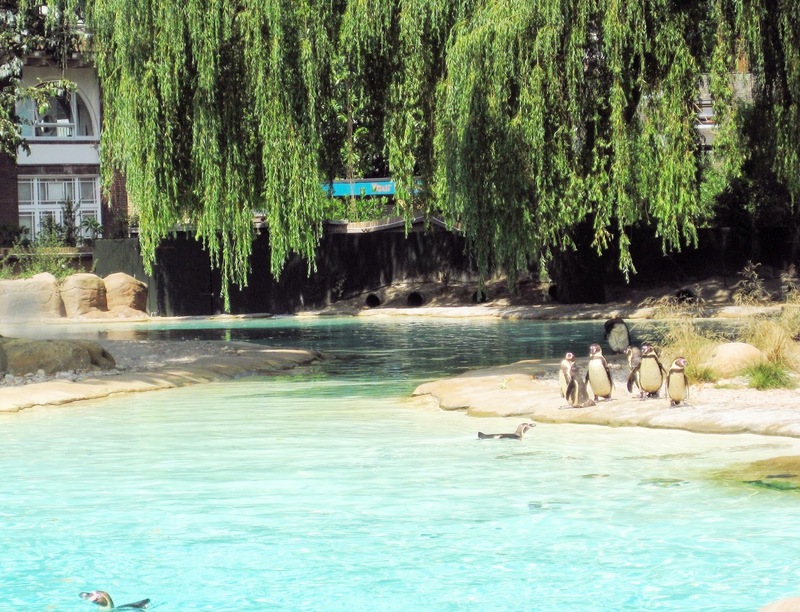 Was the trip worth it? Absolutely. Would I do it again? It all depends on where my church mind* is at. *church mind: a Nigerian slang meaning common sense resulting in good behaviou. The kind that church-going people are supposed to show. An alternative slang is "good head"
- Information on the CARES harness can be found on the manufacturer's website. "Attend cycling classes and ride bicycles outside"
That was one of my summer goals for the girls. I've had dreams of signing the girls up for a myriad of activities but my working hours and the challenge of 2 tots-to-1 adult ratio severely limited my options. With that, I was excited to see that I could actually sign the girls up for Pedalheads Cycling Course. 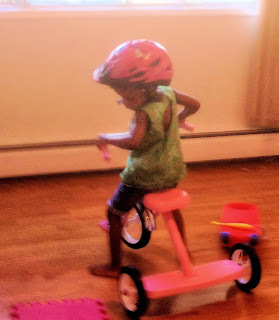 We bought the bikes, got helmets, TwinDad and I made arrangements to leave work early and we were pumped for the first class. Ah ha! Missed the part where the class actually involves a young instructor getting a bunch of 2-3 year olds to follow instructions while on their bikes. That so did not happen! The girls did everything but follow the instructions. At the end of the day, the instructor(s) were frazzled and so was I. Next day, the girls were sorta napping and I decided to "skip" the cycling class. And the day after. And the day after that too. In the end, our one week of cycling classes ended up being one day of twin-parenting experience-to-remember for mama. Practice makes perfect: I realised I could have prepared the girls for what was going to happen by practicing with them at home and explaining the process in a way they could understand. We practiced wearing the helmets so that they were comfortable with them and knew to keep them on. Shoulda riding under instruction as well. It was a bit naive of me to expect that they would be in a new situation and just know how to fall in line. And with those lessons learnt, I crossed another item off the summer list. If you've ever had classes with 2+ year old twins, any nuggets of wisdom to share with me for next time we try this? Having an outdoor family photo session was one of my 2013 summer dreams and I booked one to coincide with the girls' half birthday. I got the pictures yesterday and I think I'm officially on my way to having a girl crush on Rosie of Little Laughs Photography - our photographer extraordinaire. Every session's photos are better than the last and she makes me appreciate the importance of capturing memories is a very pretty format. Thanks Rosie, you rock. This is one of my favorites - check out the twin dynamics captured. Sugar: "I wuv you sista"
Spice: "Get your smackers off me girl!"